This Clinic consists of a Consultation Room plus separate Male and Female Treatment Rooms and an area designated to the creation of Freda’s herbal formulations. We have a small dedicated team that run the clinic alongside Freda. Freda is an Accredited Fellow Member of the Australian Natural Therapies Association (ANTA) in Acupuncture, Naturopathy, Herbal Medicine, Diet & Nutrition, Remedial & Oriental Remedial Therapy. Freda was accredited as a practitioner in 1991 and has been a qualified practitioner for 27 years. 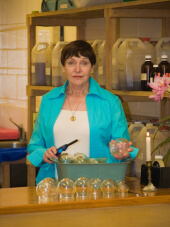 Freda is vitally involved with Natural Therapies and has served as a Director of Australian Natural Therapies Association (ANTA) for many years. During her long period of service she held the following positions at various times: National President, National Vice President, Chair National Acupuncture Branch, Treasurer, Ethical Assessment Panel Chair, Accreditation Committee Member, Constitution & Policy Chair, Health Fund Chair, CPE Chair. Freda Dunn is a Fellow Member of ANTA and in 2011 was granted Life Membership for her outstanding service to ANTA, ANTA members and the profession. Freda and the ANTA committee members were actively involved in developing standards for the Australian natural medicine colleges during their development in the early 1990s. Freda Dunn’s Clinic is based in the beautiful Noosa Hinterland on the Sunshine Coast in Queensland, Australia where for last 27 years Freda has run her Naturopathic and Acupuncture clinics. Freda is recognized by most Health Funds. Eg MBF, Medibank Private, HBA, HCF, HBA, ARHG health fund group, Manchester Unity, Australian Health Management, etc. etc. Larry is Doctor of Acupuncture and an Accredited Fellow Member of the Australian Acupuncture and Chinese Medicine Association (AACMA) in Acupuncture. He is also a Fellow Member of the Australian Natural Therapies Association in Remedial & Sports Massage as well as Doctor of Acupuncture. Larry is a very experienced Acupuncturist and Remedial & Sports Masseuse. He has over 30 years experience, the last 25 of these on the Sunshine Coast. He also acts as the Acupuncture Locum for the Clinic. Karen has completed a Certificate IV and Diploma in Remedial Massage, covering a wide range of massage modalities, as well as an Advanced Diploma in Shiatsu. She has also recently become qualified as an acupuncturist and is thoroughly enjoying working at the clinic and learning from her peers.